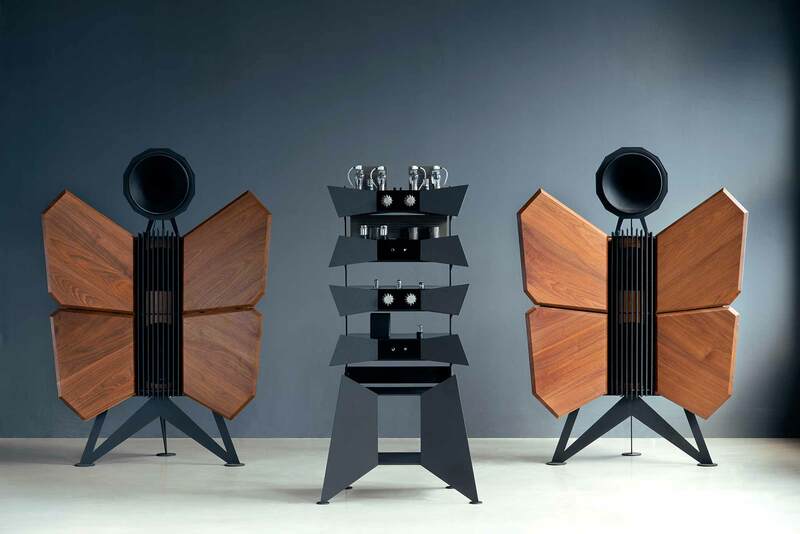 OMA offers the BK 807 amplifier constructed not in a wooden chassis, but in solid, heavy steel. An entirely new look for our 807 triode connected, class A push pull amplifier, but exactly the same circuit and components as the wood enclosed version. The two chassis BK 807M (for metal) can stand alone, but allows OMA a very new way to present audio equipment, by going back to the earliest state of the art. The Metamorphosis amplifier rack system is inspired by RCA and Western Electric cinema amplifier rack systems from the 1930's. 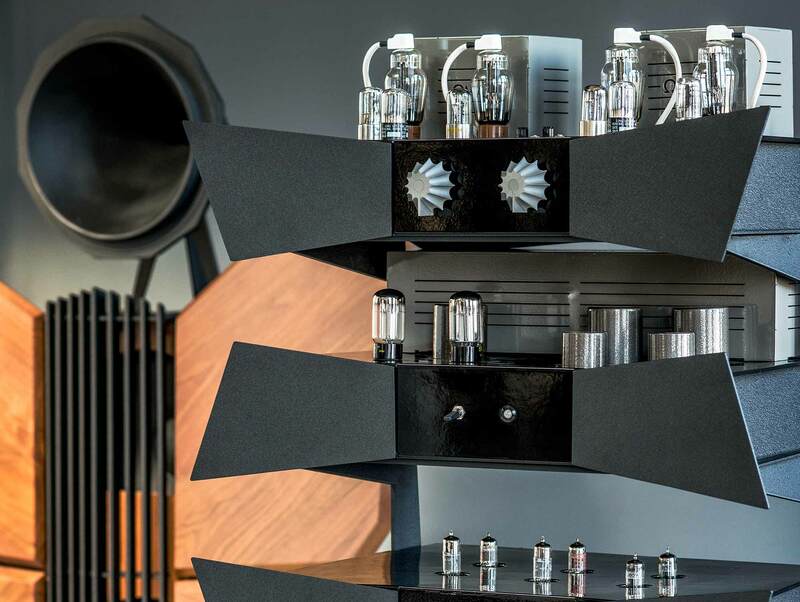 Metamorphosis dispenses with conventional audio shelving to house the BK 807 Amplifier and PD1 Pre or PD1 Phono Stage in a new and elegant way. 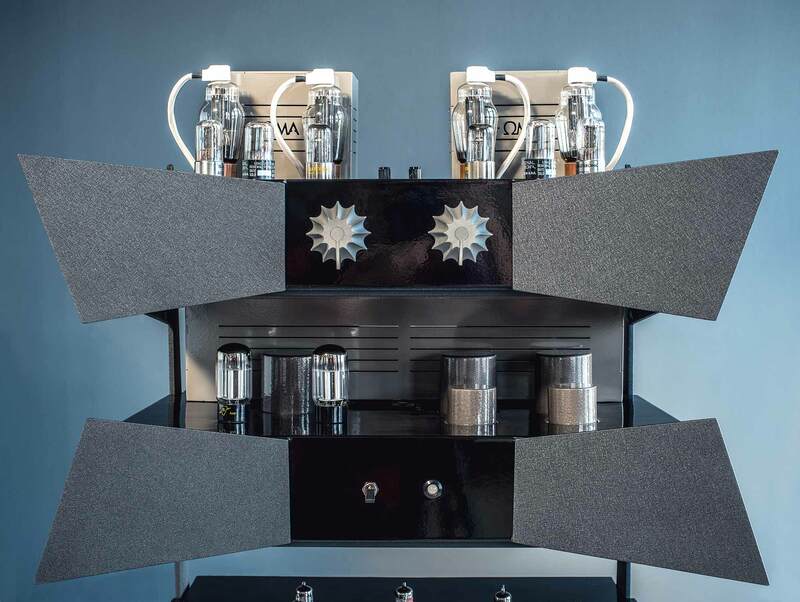 From the original handmade solid walnut chassis of the BK 807 amplifier, the new metal amplifiers and rack metamorphose into a work of audio art. Taking up a much smaller footprint than ordinary audio shelving would require, Metamorphosis is an aesthetic statement, showing that high end audio does not have to be a collection of boxes on shelves. 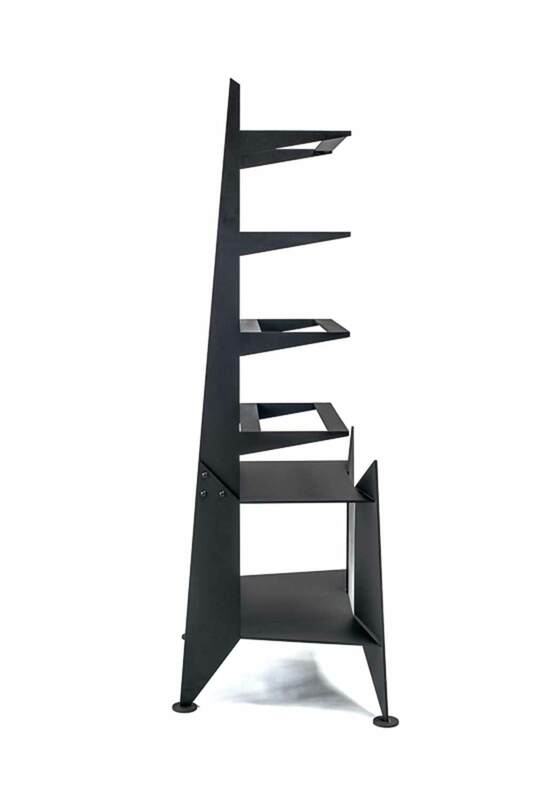 Metamorphosis can be configured in different heights and number of shelves to accommodate any possible combination of OMA components. There is space on the lower stand for peripherals, CD players and DAC's, computer audio or other devices. Composed of two sections to facilitate transportation and assembly, with its rigid, sturdy construction, Metamorphosis allows easy access from all sides, and is visually stunning from all angles. 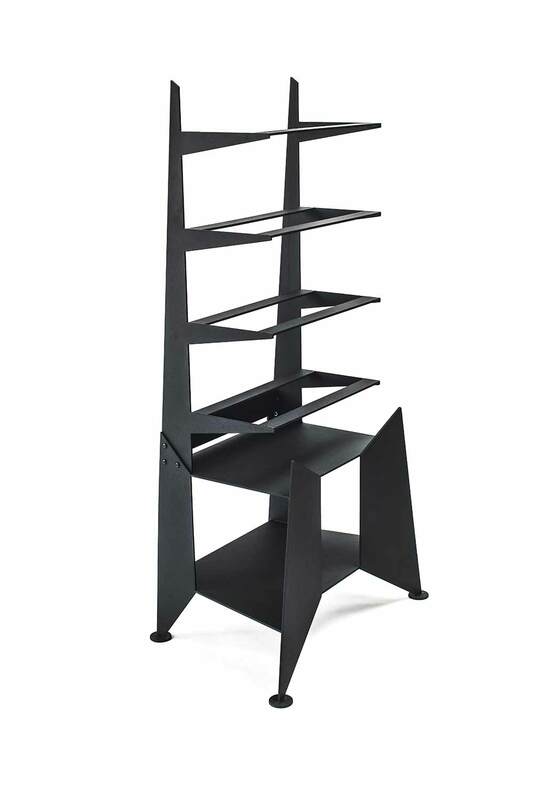 Constructed of heavy steel, with black wrinkle powder coat finish. 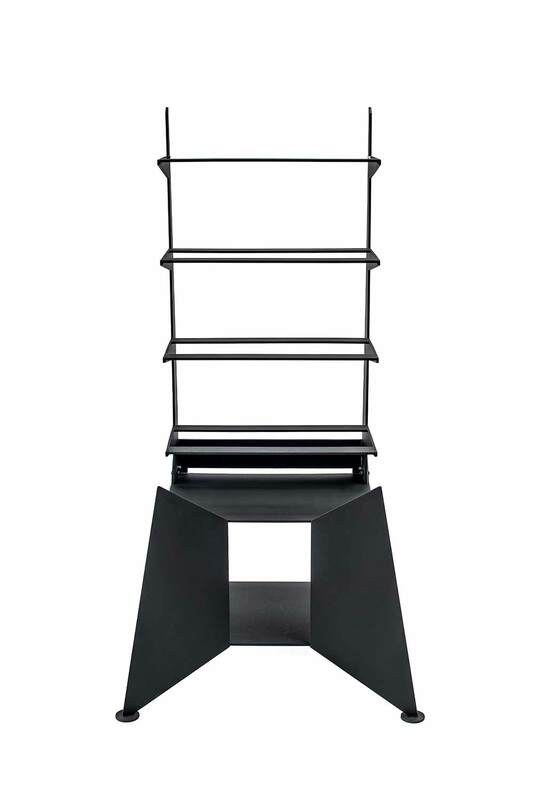 four shelf version for BK 807 and PD1 Pre 62.5"
As Shown Height 67" X Max Width 32" X Max Depth 22"
Industrial design by David D'Imperio.